Executing a Power of Attorney can solve or create problems. It is important to know how they work and how dangerous they can be. Most Estate Plans include a Power of Attorney. They can be very useful to avoid a court appointed guardianship. However, the person entrusted must be chosen carefully. A Power-of-Attorney grants a third party the right to make decisions and enter into binding contracts on your behalf. In Estate Planning signing a Power of Attorney is used to plan for incapacity. There are reasons to execute a Power of Attorney when incapacity is not an issue. These may include granting someone the power to execute a real estate contract or mortgage for a spouse who is away or deployed. However, this article will primarily address using a Power of Attorney for potential events of incapacity. What happens if someone becomes incapacitated and has no plans in place? If someone becomes incompetent without a Power of Attorney there is nobody legally authorized to handle affairs, sign checks and pay bills, transact any business or make health care and other personal care decisions. The interested parties must go through cumbersome process to have person declared incompetent,and appoint a guardian. Standard Powers of Attorney often do not permit the person chosen to engage in advanced Medicaid or Veterans Benefits training. Examinations rarely reveal financial incompetence. Insufficient Forms: The internet is ripe with POA forms that are not sufficient to meet contingencies that arise. Typically these do not have sufficient permissions to enable an agent to make or change plans to benefit the principal who granted the powers. “Principal”: Person who gives another a power to act through a power of attorney. “Attorney-in-Fact” or “Agent”: Person to whom power is given. Fiduciary, Manages property for the benefit of another. The Principal does not relinquish control or ability to make decisions upon signing of Power of Attorney. The Power of Attorney spells out the powers granted to the Agent. These can be very broad or narrow depending on the need. Incapacity: Title 10 Oklahoma Statutes § 10-103(4). b. a person for whom a guardian, limited guardian, or conservator has been appointed pursuant to the Oklahoma Guardianship and Conservatorship Act. Oklahoma recognizes two basic types of Powers of Attorney, Non-Durable and Durable. The powers granted to the Agent ceases immediately upon the incapacity of the Principal unless the statutory requirements are followed to make the Power of Attorney durable. Generally, the durable Power of Attorney is executed with the same formalities as a Last Will. 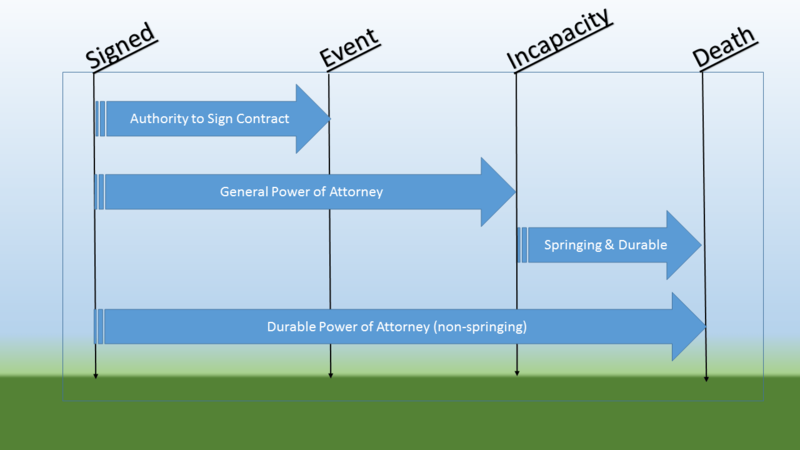 This Chart above demonstrates common examples of Powers of Attorney. The top line is an example of a power that is meant for a specific purpose such as executing a land transaction. This may be useful if a spouse is away or deployed. The next line is a non-durable power that may be granted to someone to manage affairs. The powers end if the principal becomes incapacitated. The next two examples are Durable Powers. The Third line is an example of a Springing Power that arises when the principal becomes incapacitated. The last example is a Power of Attorney that grants the Agent immediate powers and is intended to continue if the Principal becomes incompetent. Powers given can include the ability to manage finances, settle disputes, make gifts, etc. This is similar to an Advance Healthcare Directive in that includes the ability to make medical decisions. However, an Advance Health Care directive usually only covers end of life issues and does not provide for medical treatment and living arrangements for someone who is not at an end-of-life event. This makes the Agent an attorney who can appear in court. When you create a Power of Attorney you give your rights away. Only a lawyer can be your Power of Attorney. Power of Attorney is a substitute for a Will. The person given the Power of Attorney can send you to a nursing home. I’m young so I don’t need to worry about it. My spouse can take care of everything. My Advance Healthcare Directive “Living Will” is all I need.